Have you ever wondered how to tell the difference between a bright star and a planet in the night sky? Astronomers have a trick: see if the Earth’s atmosphere makes it twinkle. Planets don’t twinkle because, even with a small telescope, they appear as little circles in the sky. It takes a lot of atmospheric turbulence to distort the image of a circular disk. But if you point that same telescope at a star and zoom all the way in, you’ll never zoom far enough to turn that dot into a disk. A star-dot is a “point source” in astro-speak, and dots twinkle. In recent years, however, advances that pair adaptive optics with powerful telescopes have started resolving real images of the closest, biggest stars. Adaptive optics essentially cancels out the turbulence of twinkling, allowing a telescope to see the disks of stars. Today’s paper uses this technique to study Betelgeuse. You know Betelgeuse—it’s the bright red one in Orion’s shoulder that’s bound to explode “soon” (so, maybe in the next 100,000 years). It’s an immense red supergiant; the type of star that regularly pushes the envelope of stellar physics. The first paper in this series used images in near-infrared wavelengths to partially resolve Betelgeuse’s photosphere, or visible surface, and begin to characterize the asymmetric material surrounding it. A second paper discovered that Betelgeuse’s circumstellar material is clumpy in the infrared, likely due to dust formation, and extends to tens of solar radii. (That sounds huge, but keep in mind Betelgeuse itself is nearly 1000 times larger than the Sun!). 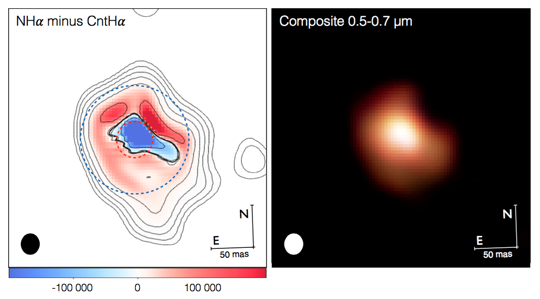 As it turns out, adaptive optics and polarized visible light are a great way to probe Betelgeuse’s secrets, and that is the focus of today’s paper. This light has lots to tell us about interactions among the star’s surface, the closest and most-recently-ejected clumps of gas, and brand new polarized dust. Asymmetric Betelgeuse and its environment imaged in visible light (top) and polarized visible light (bottom). Each column is a different filter. The red dashed circle indicates Betelgeuse’s infrared photospheric radius. The light dashed circle is three times this. As you can see in the images above, Betelgeuse is not symmetric, and neither is its circumstellar material. The top row shows brightness in different visible-light filters while the bottom row shows degree of polarization (light colors are more polarized than dark). Most of the imaged polarized light is far from the star’s photosphere, and is probably polarized due to dust scattering. However, bits of this dust are close to the star, too! It’s well known that red supergiants like Betelgeuse lose significant amounts of mass. Mass loss seems to be connected to the huge convective cells inside supergiants, because they too are not spherically symmetric, but we don’t know precisely how. We do know the lost mass forms a circumstellar envelope around the star and and provides the material from which dust can form. It follows that if the dust was all far away or all close-in, that would tell us something about how it got there. Instead, at any single distance away from the star, we find different amounts of dust and gas in a range of different temperatures and densities. Left: A map of hydrogen emission (red) and absorption (blue) in the vicinity of Betelgeuse, with the same dashed lines as before for reference. Right: Color composite of three of the filters from the first figure (the narrow hydrogen alpha filter is excluded). Two of the filters used to image Betelgeuse are sensitive to the familiar red hydrogen alpha spectral feature. Because one filter is broader than the other, subtracting the light in the narrow filter from the light seen with the broad filter yields a map of where hydrogen gas is emitting or absorbing light. It also turns out to be highly asymmetric. Most of the hydrogen emission is confined within a distance of three times Betelgeuse’s near-infrared radius. It’s a similar distance from the star as most of the polarized dust, but the spatial distributions are different. 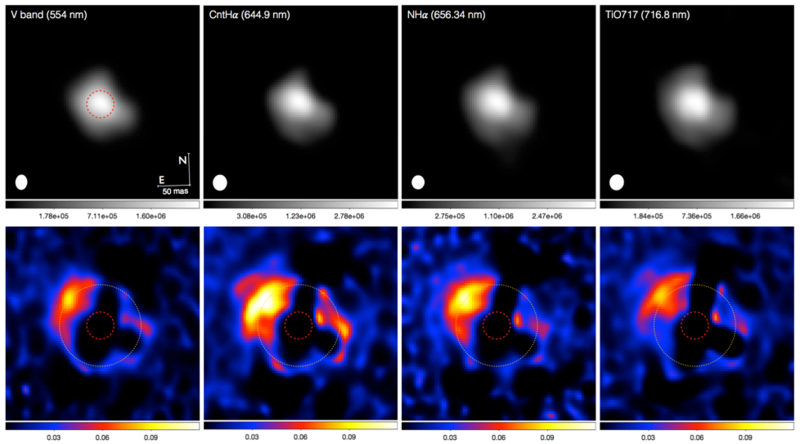 The main result of the paper is that Betelgeuse’s asymmetries persist in both in dust and gas, with a major interface between the two located around three times the near-infrared stellar radius. 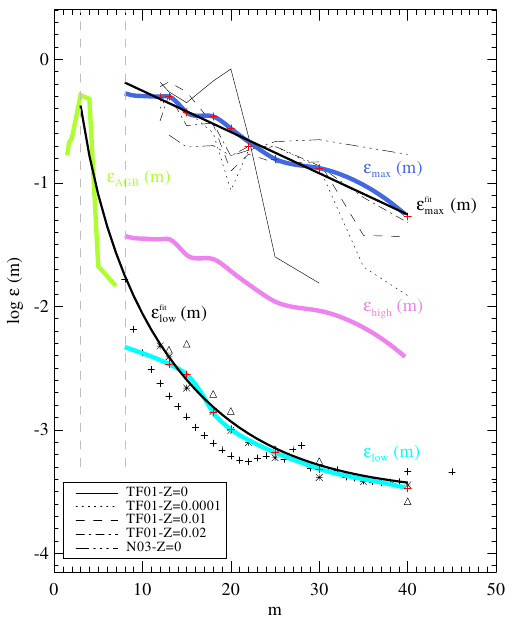 These asymmetries agree with different types of past observations and also strongly point toward a connection between supergiant mass loss and vigorous convection. Unlike many cosmic blobs, we should be able to witness Betelgeuse change shape. The authors close by suggesting we study how the inner edge of Betelgeuse’s circumstellar envelope evolves with time. So far we only have static images, but if there’s one thing astronomers like more than pictures, it’s movies. Besides, who knows—maybe we’ll catch a supernova in the making! Meredith received her PhD in Astronomy from New Mexico State University in 2016. She was a regular astrobites author from 2013–2016 and assisted with the website and social media from 2015–2018.